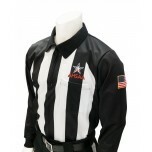 These are the AHSAA approved football referee shirts. Great item good fast shipment. Very warm and nice quality. No problems with the referee shirt...just remember 2018 is a transition year and going to a new shirt in 2018. Fit as expected and pretty lightweight. Collar is a bit large (much bigger than the baseball shirts) but seems to be standard on these shirts.